Finally, I'm making progress in patching together these re-purposed wool shirts into a modern improvised bed quilt. I was stuck for a while, so when I began working yesterday I decided to keep my mind peeled for restraining forces, things that were holding me back from flowing through the process. I soon realized that worrying about the outcome was my number one restraining force. As soon as I let go of the outcome, things started to flow. 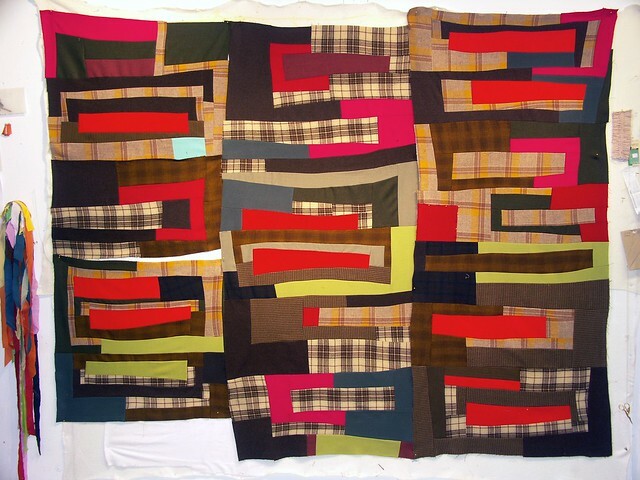 I expect to finish piecing my improvised [ ] parenthesis quilt today.